Consumer Confidence Edges Up Again; Reaches Highest Point Since Early 2008 : The Two-Way Consumers purchase more than two-thirds of all goods and services. If they're feeling better, that's a good omen for the overall economy. If they're confident, they will shop: Two women carry shopping bags down Manhattan's 34th St. last week. 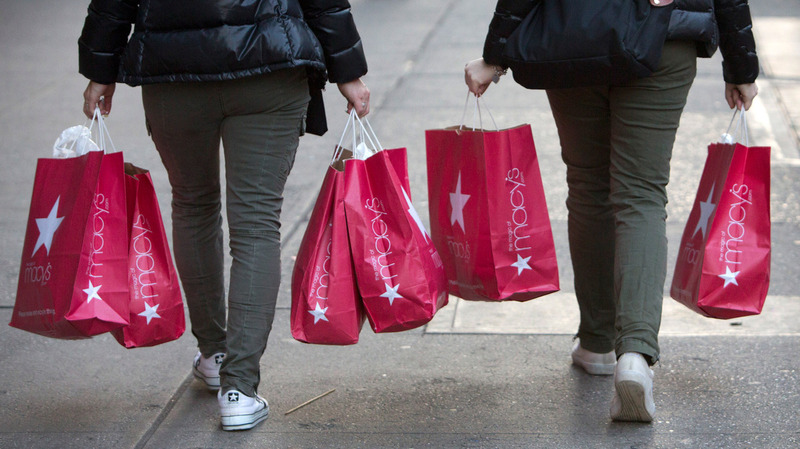 There was a "moderate increase" in American consumers' confidence this month, the private Conference Board just reported. Its widely watched consumer confidence index rose to 73.7 from 73.1 in October. The index is the highest it has been since February 2008, when the economy had just fallen into recession and was headed down. The index is closely watched, of course, because consumers buy about 70 percent of all the goods and services produced. So if they're feeling more confident, that could mean good things for the economy. This could also be a sign that the holiday shopping season, which appears to have gotten off to a pretty good start, will be strong.